Dear Sports Media: The Bills Are 2-0 and Possibly Deserving of Some of Your Attention. Here’s something I’ve been thinking about a lot lately: With any job, you’re going to have your ups and downs. At some point, you have to decide whether the downs outweigh the ups to the point that it’s not worth it for you to have that job anymore. You could call it a satisfaction/misery ratio. If that ratio swings past 20/80, it’s time to go. Speaking of Jay, I joked in last week’s NFL preview that “Any time ‘Our QB should be better this year because he’s finally treating his Type 1 diabetes’ is your best reason for making the playoffs, I can’t pick you to finish higher than 7-9.” That led to a few readers who either have diabetes or know someone with diabetes e-mailing to say they were disappointed that I made fun of diabetes just for a laugh, which immediately got me excited — since that clearly wasn’t the case — and secretly hoping the whole thing would snowball and ESPN would ask me to apologize, creating my dream scenario of me standing up for a harmless joke and the depressed state of comedy in general, eventually getting suspended because the American Diabetes Association was protesting me in Bristol, then having our ombudsman write a post about me to cap things off. That didn’t happen. Simmons’ growing dissatisfaction with his position at ESPN is well documented throughout sports media blog circles. However, to come out and say that in a column, and let your editor run with it, makes me beleive that he is on his way out. Do I blame him? No. Bill Simmons needed ESPN to reach a better place in his career, but he has a fan base that could easily transfer to his own site. He is his own brand. He was “Boston Sports Guy,” then became “ESPN’s The Sports Guy,” and, with the right web developers and savvy new media PR staff, could be just the plain “Boston Sports Guy” again. He could write as long as he wanted, as much as he wanted, whenever he wanted. He wouldn’t have to mince his words about ESPN personalities. Bill Simmons, if you are really thinking of the above, go assemble yourself a crack staff and get ready to strike out on your own. But until then, don’t post loaded thoughts like the quotes above in your column for your current employer. Not a good idea, Bill Simmons. Up there with posting photos of you drinking with scantily clad underage girls on Facebook or MySpace (which he hasn’t done, but college students do all the time), blasting your current employer is not advisable if you want a successful career. We tell students that all the time. Seeing that the Bills only make Monday Night Football appearances every thirteen years, I figured I should probably record it for perpetuity. Well, that and I wasn’t able to join the Bills Backers of Boston down at their big Monday night party at The Harp because I had to work super early the next morning, so I had to do something special to mark the occasion. Instead, it became a running diary of how sad and trying it is to be a Bills fan and a Western New York native, especially whenever you face any professional sports team from Dallas. I don’t like to gamble. I cringe when my father hands me a scratch ticket for a holiday. My toes curl when my boyfriend drags me into a casino. Despite my superb football picking skills, I’ve never been tempted to place monetary bets on a week of picks. Maybe it was my penny pinching childhood. Maybe it’s because I think the existence of Native American run gaming facilities has significantly affected the social and economic status of Native Americans for the worse. When it comes to gambling, I can’t see the reward outweighing any risk. Ending a wicked busy commencement weekend by taking a short little trip to Providence to see the last hockey of the season. Going to Poughkeepsie to attend my college friends’ wedding and getting to room with Regina again. Taking four flights (yes I got on a plane for the first time in five years) in order to attend my little sister’s graduation party in Rochester. Driving out to Framingham for dinner with Caitlin and Chris and sharing the road with the Speeding Nuns. Traveling to Yarmouth, Freeport and Kittery, Maine to attend a clam festival and to see the fine state of Maine for the first time. Sticking my toes in the Atlantic for the first time while on a day trip to Martha’s Vineyard. Of course, no exploits are complete without a jaunt to cheat death in East Somerville, MA. 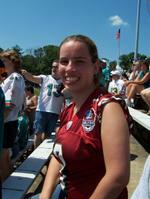 SEEING STEVE YOUNG GET INDUCTED INTO THE PRO FOOTBALL HALL OF FAME! Okay, my brother and I didn’t do that. 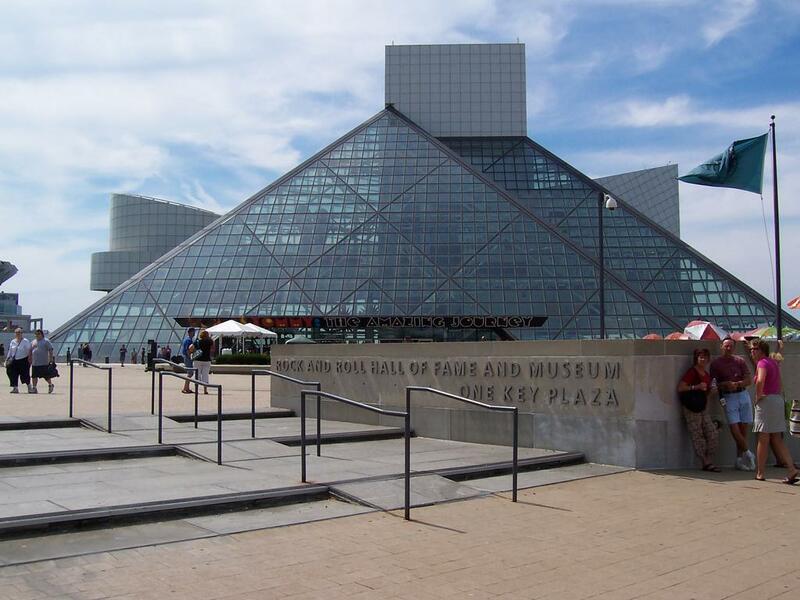 The Cleveland detour took place on Saturday afternoon (and was not exterampeous in any means, as I had mailed my parents the “Hasenauer Hall of Fame Weekend” iternary weeks beforehand, in their folder of relevant trip information. And they think I have OCD–where would they get that idea?) My family arrived in Cleveland, parked on the waterfront, and headed over to the museum. As we walked the steps of the Rock n’ Roll Hall of Fame, we saw our first Dan Marino fan. Remember, this was Saturday afternoon, in Cleveland, 45 minutes away from Canton. And there this guy was, in a white, teal and orange 13 jersey. No biggie, I thought. There was bound to be a few. A few turned out to be 20, 000. 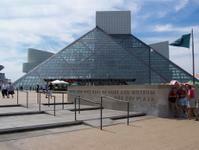 We saw around 200 at the Rock N’ Roll Hall of Fame alone. Teal jerseies, orange jerseies, official t-shirts, homeade t-shirts, NFL jungle pants, orange hats, the number 13 EVERYWHERE. My parents and Sam were out like a light that evening, and I would of been as well, had there not been the ESPN Classic Hall of Fame Weekend on. I have never been known to turn down a viewing of the 1993 San Fransisico 49ers Yearbook (well, except for the last five minutes–the NFC Championship Game), so I stayed up and watched that. But soon enough I went to bed, knowing full well that we would have to depart early to beat all the Marino-ites to Canton the next morning. While this was going on, my family hung back, pretending that they didn’t know me, as they would end up doing several more times that day. We then went into the museum (warning: during Hall of Fame weekend, they do raise the admission prices.) 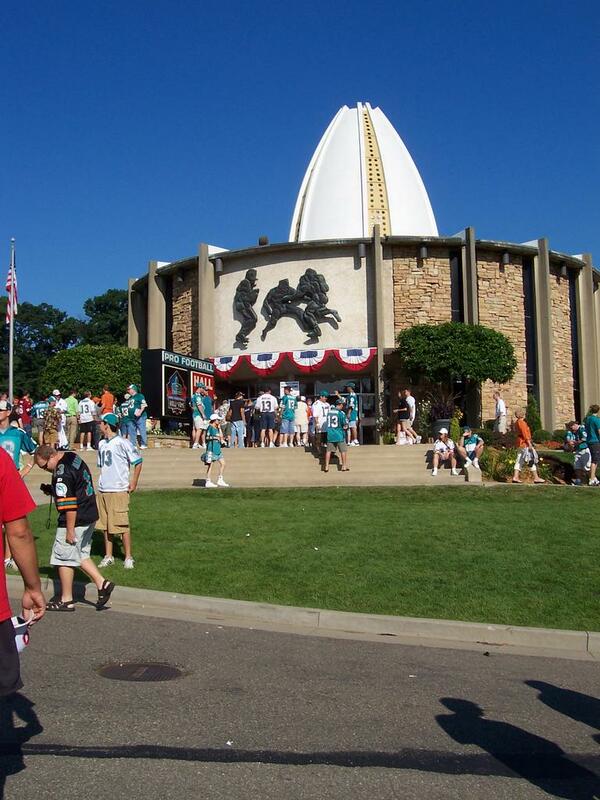 The Pro Football Hall of Fame is an absolutely awesome place if you are a football fan. There is just so much memorabila and information that it is almost overwhelming. It is also in a very cramped space, so if you’re claustrophobic, I reccommend going on like a Tuesday morning in the middle of October or something. Lucky for Hasenauers, we’re used to being crammed into spaces tighter than sardines in a can (anyone who has seen the house I grew up in can attest to that), so the throngs of people that were mingling around the hall didn’t bother us. Among the highlights is the Super Bowl section, with the box score and memorbila from every Super Bowl (including rings, not to mention a Brady jersey at every turn–it’s what you get when you win three in four years! ); the “Other Leagues” section, with great information on the AFL and USFL (including a blown up front page of the Rochester Times Union from the 1920s when Rochester had a pro team); and the photography exhibit highlighting the best photos from the 2004 season. 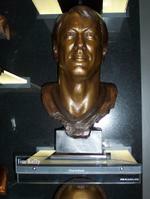 There is also the actual Hall of Fame with all of the busts of every inductee (see Jim Kelly at right), which is a great history lesson for those of us who started watching football back in the early 1990s. I must say that some of the busts look absolutely nothing like the actual people (the Kelly one is pretty close, but the Marv Levy one looks like they used a “generic old man” model.) They had the engraved shelves installed for Young and his fellow inductees already, but the busts would be unveiled during the ceremony and placed there afterwards. My absolute favourite part of the Hall of Fame had to be when a young boy and his family who were guests of the Steve Young Foundation sought me out to take a picture of them in front of one of the Steve Young exhibits. “We’ve been looking for a friendly face,” they laughed as they handed me over their camera. I was like totally shaking, and didn’t have the guts to ask where they got their Steve Young straw hats (all of Young’s personal and foundation guests had a special straw hat with a red embrordered scarf tied on it) or if I could hang out with them for the rest of the day. 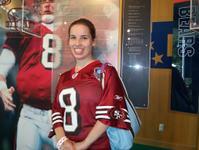 That would be the closest I got to meeting Steve Young, but that was cool enough for me. Of course, after viewing all of the exibits, my family and I made our way to the museum store. In the line to get in, I had my first celeb siting–well, not just siting, but bumping. Junior Seau, now a Dolphin, but a former Charger (he played for them in the Super Bowl against the Niners in 1995), was walking the opposite direction out of the press room near the store, and brushed by my shoulder. Nearby was Zach Thomas. Both were very nice and all smiles as all the Dolph-fans they passed oohed and aahed. 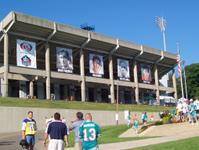 After spending way too much money in the museum store, my family and I made our way to Fawcett Stadium for the ceremony. While waiting in line, Cris Carter rushed to the VIP entrance, with a fan trailing him. Only seconds later on the other side of the line, Chris Berman (who was to be the emcee of the ceremony), was driven past us to the stage in a golf cart. Everyone was cheering him as he drove by, and he waved. He looks exactly the same as he does on TV–like everyone’s crazy uncle. Now to the ceremony itself. It was such a good ceremony–except for the burning sun just frying my family and I in the stands. My parents and brother had to keep going downstairs and getting away from the sun to prevent getting sunburned. I usually don’t burn at all (that’s the 10% Italian in me), but even I was beginning to feel it. But what was even more annoying was the sixteen gazillion (okay, I mean 20,000) Dolph-fans, who were only there for their number 13. They were loud and annoying at times, not to mention rude. 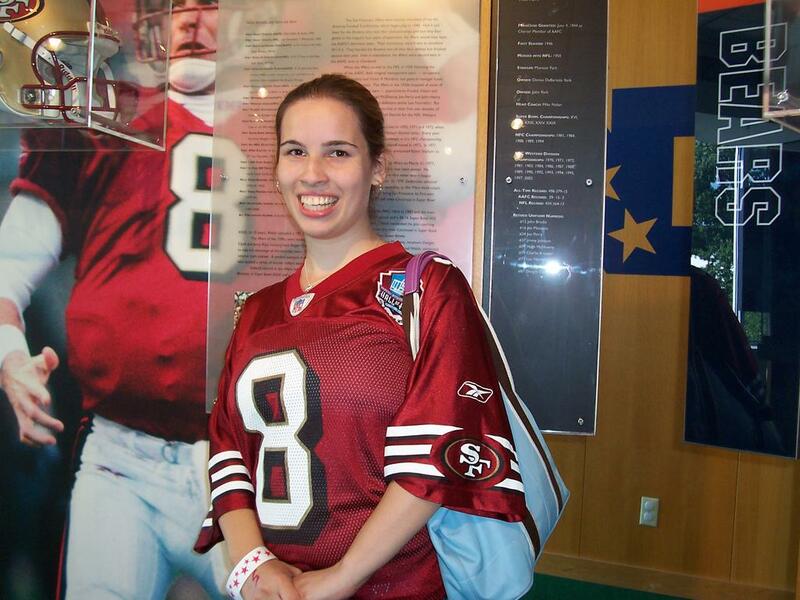 (There was one guy in back of me in line in the store explaining to his obviously-dragged-along girlfriend why Steve Young didn’t deserve to be inducted, and that the only way they were going to let him in was to induct them a year with “totally the best QB of all time” so he would be outdone. I don’t know if the guy was blind to my bright scarlet number 8 jersey in his face, or if he was just trying to get my goat. I’d love to say that guy was the exception, and not the rule, but unfortunately, it was the other way around.) But I didn’t let it bother me, and settled in to hear Grit Young introduce his son. All I have to say is that it is glaringly obvious that the Young clan are lawyers. 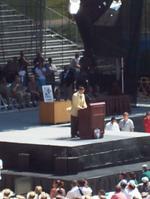 35 minutes later , Steve Young took the podium. Steve gave us his useful well prepared remarks, expressing his gratitude to everyone (even Joe Montana, who was noteably absent from the lineup of previous inductees.) It was also interesting to hear him and his father speak about his family life–something a lot of people don’t know about, since he got married and had kids after he retired. 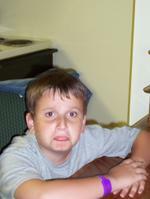 We also got the standard story about how his mother came charging out onto his Pop Warner football field one time because a member of the opposing team made an illegal hit on her son, and the story of how he made his parents drag the whole family to the Hall of Fame on a family vacation–and how his siblings only agreed if they all got to go to Hershey Park afterward. He spoke for quite a while, but I relished every minute of it. He was obviously just soaking up the moment of being inducted, and realizing that there were some fans there for him, hidden amoungst the vast seas of teal and orange. He was so appreciative that you couldn’t help but feel happy for the guy, even if you were a Dolph-fan. So my family packed up and left before the Dan Marino celebration began. Rude? Maybe. But I wasn’t willing to risk heatstroke to see the arch-enemy of all Bills fans get inducted. We packed into the family roadster (well, actually the family Buick Rendezvous) and headed back to Rochester, sunburnt and carrying six tons of Steve Young memoribila. A little less than five hours later, we were back in Rochester, and ten hours after that, I was back in Boston. It was a short trip (and yes, I missed my chance to stick around for Monday’s Meet and Greet with the inductees–I needed to get back to Boston by Monday afternoon), but it was worth it. I know this probably sounds amazingly stupid, but it was amazingly cool to do something that I said I’d do since the age of 13,which is when I turned to my father the summer after Super Bowl XXIX and asked him if we could go see Steve Young get inducted to the Hall of Fame whenever he was elected. I don’t think my father ever thought I’d 1) remember that or 2) really drag my whole family along for the ride when it did happen. 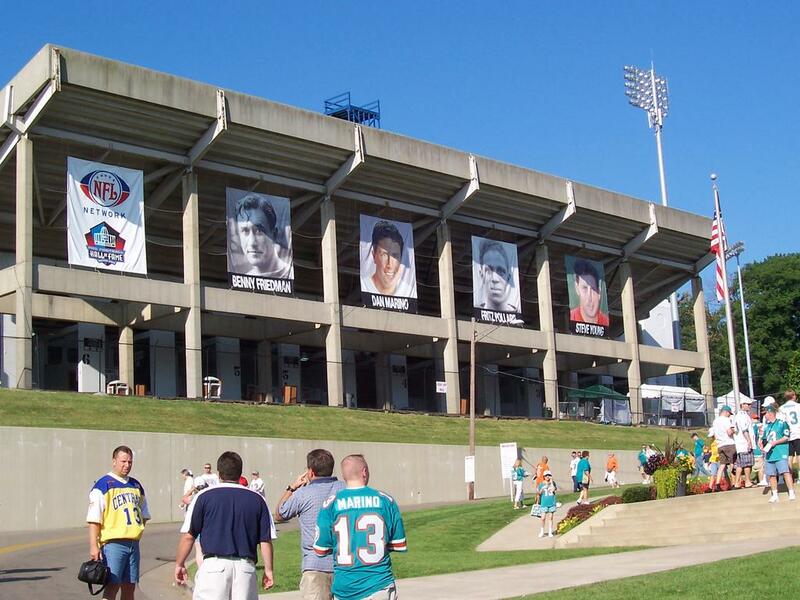 So thank you Mom, Dad and Sam for letting me drag you to the boondocks of Ohio for Steve Young–and do you think we can go again in five years when Jerry Rice gets inducted? Please?